PetsLoveToys is a new monthly dog subscription service that let’s you select what kind of toy or treat you want your pup to receive. I think this is great especially if your dog only likes certain types of toys or treats. COUPON CODE: Use code MYSUBADDX20 to save 20% on your first month! The Products: Toys and treats you select! 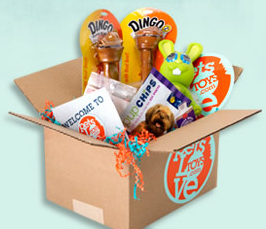 Extra exciting news – one reader will win a free 2 month subscription to PetsLoveToys! There are lots of ways to enter – so make sure to sign up! I’ve subscribed to Pawalla and I’m sure Harvey would love new toys from PetsLoveToys! My dog can never have enough toys, thanks for your amazing reviews ! I have subscribed to pawalla and Bugsybox. Sawyer loves treats but he’d got crazy for a new toy! He’s very active and loves to play! I’d pick a toy – this would be a great Xmas gift for the family with whom we always spend Xmas as they have a golden retriever! I’d pick a toy. My dog actually doesn’t like too many treats but she LOVES toys! I would alternate. One month he could have toys, the other month a treat 🙂 My puppy is a tad spoiled. I’d pick a toy that you can put treats in! Or treats that can be put in a toy! Haha. What can I say? I love everything multi-purpose (or maybe I’m just a greedy person ;D)!! I’d pick a treat, it’s their favorite part after their meal! I’d pick toys because Lucy is very picky! My dog Sophie would probably prefer treats – she’s thin, but loves to eat! Thanks for the contest – it’d be nice to try this out! One of my dogs is really tough on toys, so I’m constantly having to get him new ones. He’d love to win a cool toy. My Ava would love a treat..she is used to getting a few here and there,but because she is so particular..Its hard to find things that she likes..I would love to win this..We have tried a few subscription boxes..and although they were very nice,they just didnt suit her tastes.I hoe we win. !